From 31st December 2012 the new British Standard BS8599 came into force as the guiding standard on First Aid kits for the workplace. As an employer (or employee responsible for Health and Safety) you will be expected to be aware of the latest guidance. The new guidance is more flexible and appropriate to most businesses and industries. Some unscrupulous retailers will try to convince you that their BS 8599 First Aid kits are mandatory and that it would be illegal to use any other kind of first aid kit. This is definitely not the case, merely a sales tactic. As long as you have appropriate First Aid provision that suits your needs you are fine; you do not need to replace your existing kits just because a small piece of legislation changed. In fact, the new standards encourage businesses to tailor their kit contents to their needs, even if that means adding items which are not on 'the list'. For more information, read about how you should conduct a First Aid Needs Assessment. This standard replaces the BHTA-HSE kits 10, 20 and 50, that were universally used in the UK, and are based on the HSE guidelines. The BHTA standard was published in 1997, and is long overdue a review. Despite many EU states having a national standard for workplace first aid kits, until now, the UK did not. The BHTA guidelines, established in 1997 were in need of revision because training protocols have changed, there are heightened concerns with infection control, and new technology is now available at more affordable prices. 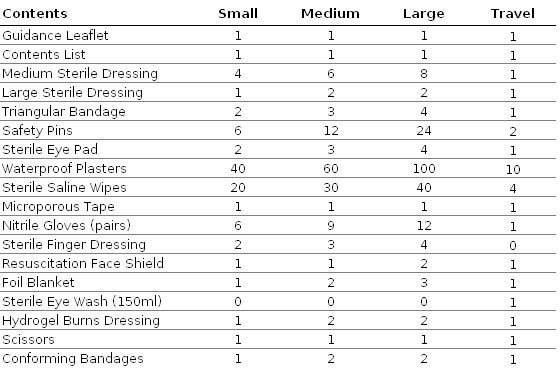 There were only one pair of gloves in a 10 person kit - yet 33 dressings. There were 4 triangular bandages - even though the training protocols no longer indicate their use for immobilisation of lower limb fractures. Burns gel dressings are extensively used in first aid - now very available and affordable. The new kits have good quantities of plasters and wipes, a common criticism of the old ones. More quantity reflecting the need, and Nitrile type in line with NHS guidelines. Sensible quantities, reflecting consumer demand. Increased quantities, reflecting consumer demand. New specification is sterile and now must meet the European CE marking rules. Fewer quantities, reflecting consumer demand. Quantities are reduced reflecting the change in training first aid protocol, where immobilisation of lower limbs using triangular bandages is no longer indicated. A smaller finger dressing is introduced specifically for finger injuries that are too large for first aid plasters, dressing complete with an easy-fix adhesive tab. Every employer with as much as a kettle, must have a risk from burns. A modern burns gel dressing is added to meet this risk, together with a conforming bandage to attach and retain it. Many first aiders prefer not to use safety pins; adhesive tape is an easy and inexpensive way to secure dressings and bandages. Safety pins are, unfortunately, still retained, allowing users a choice of application. We have been advocating these for years as a replacement to the ineffective 'token' scissors fourn in conventional First Aid kits. Clothing around wound sites needs to be removed to allow first aid treatment. Shears, capable of cutting fabric and leather enable this removal. Shock presents one of the most serious life threatening risks to a casualty, treatment includes keeping the casualty warm. The introduction of the foil survival blanket enables this. The introduction of a mouth to mouth resuscitation device, incorporating a one way valve, protects the first aider from infection. Incorporated into the travel kit since fixed eye wash stations are unlikely to be available. The environment of a travelling worker is unpredictable and could include a risk to eyes. There are four sizes of first aid kits, workplace small, medium, large and a travel kit. Travel kits are intended for groups or individuals who frequently work away from the office, on sites or spend time traveling as part of their work. Employers are required to make a risk assessment to decide what the hazard levels are and how many employees are involved in the area to be covered. Here is a guide provided to help match this risk assessment to an appropriate size kit. And of course, we can show you how to use them. Further reading: How to make your own First Aid kit.